'The finding is remarkable because the crows received no assistance or training in making these combinations, they figured it out by themselves,' said Auguste von Bayern, from the Max Planck Institute for Ornithology and the University of Oxford. The New Caledonian crows (Corvus moneduloides) from the South Pacific are of the same species as Betty, who became famous in 2002 as the first animal shown to be able to create a hooked tool by bending a pliable material. 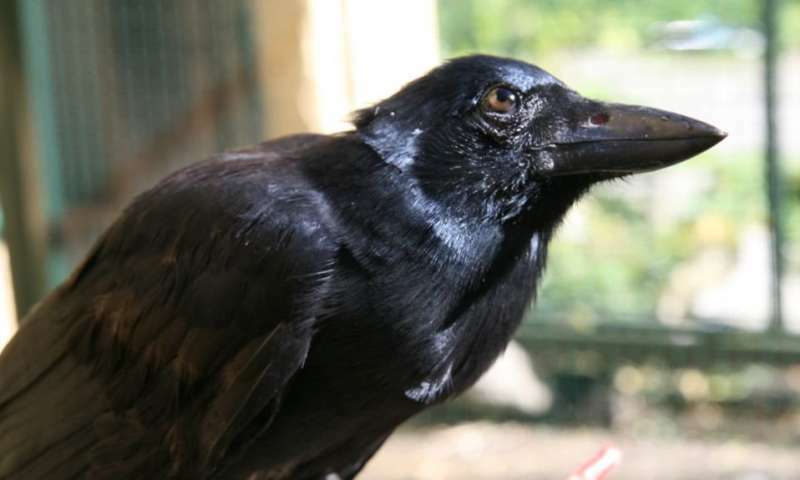 The researchers presented eight New Caledonian crows with a puzzle box they had never encountered before, containing a small food container behind a door that left a narrow gap along the bottom. Initially, the scientists left some sufficiently long sticks scattered around, and all the birds rapidly picked one of them, inserted it through the front gap, and pushed the food to an opening on the side of the box. All eight birds did this without any difficulty. In the next steps, the scientists left the food deep inside the box but provided only short pieces, too short to reach the food. These short pieces could potentially be combined with each other, as some were hollow and others could fit inside them. In one example, they gave the birds barrels and plungers of disassembled hypodermic syringes. Without any help or demonstration, four of the crows partially inserted one piece into another and used the resulting longer compound pole to reach and extract the food. At the end of the five-step investigation, the scientists made the task more difficult by supplying even shorter combinable parts, and found that one particular bird, 'Mango', was able to make compound tools out of three and even four parts. Although the authors explain that the mental processes by which the birds achieve their goals have not yet been fully established, the ability to invent a tool is interesting in itself. Few animals are capable of making and using tools, and also in human development the capacity only emerges late. While children start using tools reliably when they are about 18 months old, they only invent novel tools suited to solve a given problem reliably when they are at least five years old. Archaeological findings indicate that such compound tools arose only late in human cultural evolution (probably around 300,000 years ago in the Middle Palaeolithic) and might have coevolved with planning abilities, complex cognition and language. 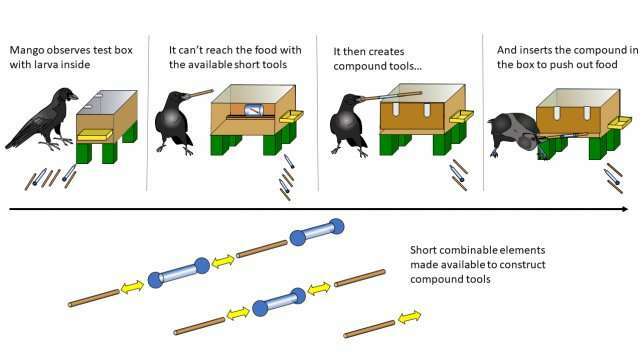 The crows' ability to construct novel compound tools does not imply that their cognitive mechanisms equal those of humans or apes, but helps to understand the cognitive processes that are necessary for physical problem solving.